Several weeks ago the willow tree in front of The Medical Centre was removed to make way for the Medical Centre expansion. 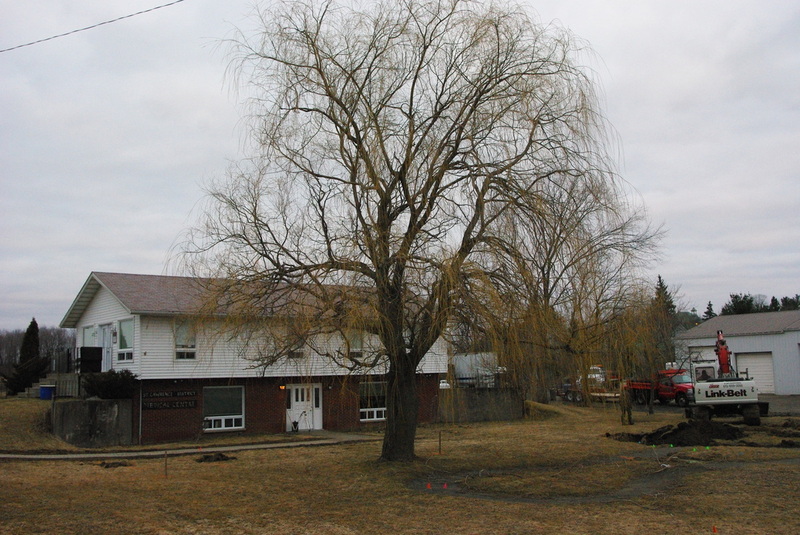 This lovely willow had a unique history - it was planted and nurtured by the original children and staff of Willow Tree Day Nursery twenty-six years ago. The daycare was then in the bottom portion of The Medical Building. Beginning as one of several branches taken from a willow tree, which grew in front of Amy Newell's home, it was next put into a juice can at the daycare as part of our spring theme. Water was added and the children dropped in stones to stabilize the arrangement. Next the branches were decorated with Easter eggs. Our effort at creating a healthy environment for the willow twigs was rewarded when the branches very quickly burst into leaf. The children were entranced by this and added to the arrangement by decorating it with butterflies and flowers. The branches, however, couldn't be sustained in a can forever and spring themes make way for those of summer. I dismantled the display to find that one of the branches had developed a healthy system of roots. It was only natural that we take the rooted branch to the next step. After all, we were The Willow Tree Day Nursery. The playground, plagued by a high water table, would benefit from a thirsty willow and we needed a shade tree. The branch was planted by the children and faithfully watered throughout its first summer. It thrived under their care. The following summer it was defoliated by hungry caterpillars (another learning experience for the children), but with some judicious pruning the branch quickly became what it always wanted to be- a tree. Before the tree was removed Peter Christie and I braved a cold and blustery day in March to take some cuttings, with the intention of keeping The Willow Tree Day Nursery willow alive. My sunroom is now full of dozens of cuttings rooting in buckets and Peter will be turning parts of the tree into beautiful salad bowls, while the base of the trunk will become a unique and very special coffee table.